Six thousand feet of pristine shoreline. Away from the crowds. Even if you came here to be in the center of it all, it can still be nice to get away from it all … if only for an afternoon. Henderson Beach State Park is about 20 minutes east of our beachfront hotel, just before the hubbub and glitz of Destin. It’s a calm before the storm, albeit not a bad storm. Destin, once a small fishing village, is now home to tons of shopping centers, fishing charters, water parks, restaurants and more. And right before you get there … there’s this. A beautiful state park dedicated to preserving the tranquil ecosystem of sand pines and dune birds. Boardwalks provide access to the Gulf of Mexico for swimming, paddling or fishing. A children’s playground is one of the first stops on the nature trail, where you may view coastal birds, dolphins, sea turtles and small reptiles. The hike is three-quarters of a mile through sand dunes. The beginning of the trail is set on a wonderful hill overlooking the water. The sand is hot, so we recommend wearing flip flops or water shoes. A park ranger tells us most people come here for the beach, which is very friendly both to locals and tourists. It’s an uncrowded, quieter place to sun and swim than many public beaches along the coast. If you are celebrating during your visit, Henderson Beach State Park can be a lovely setting for a birthday party or family get-together. Large covered pavilions, grills and public restrooms lead down to the beautiful beach. As we amble through the park, we spot a woman walking her dog, and decide to ask what led her here. It turns out she’s from Oregon. She drives all the way to Florida and stops here every time. It was an eye-opening reflection and a reminder that this beach doesn’t belong to us just because we plop some big buildings down on it. Getting back to nature is a welcome break to that will help you remember what’s truly special about the beach – it makes you slow down and take stock of all the good. Entrance to the park is $6 per carload of two to eight people, $4 for an individual in a vehicle and $2 per person by foot or bike. 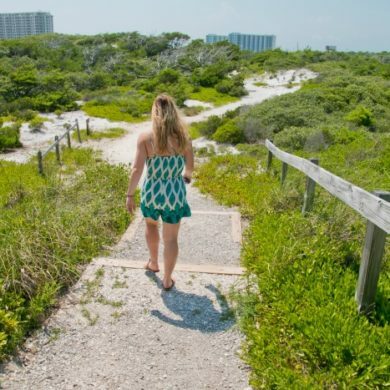 Henderson Beach State Park is located at 17000 Emerald Coast Parkway in Destin FL. For more information, visit the park website or call (850) 837-7550.